Can behavioral change address local energy issues, raise people’s awareness energy consumption issues, and directly support non-profit organizations at the same time? With the Nice pilot of the CITYOPT project, we have seen strong suggestions that it can. It also suggests that the sense of belonging to a local community is a strong motivation for people to participate in energy reduction programs. and presented during the final event in Nice, France. A French version of the video is also available. Funded under the FP7 European Commission framework, CITYOPT started in 2014, with the aim of creating state-of-the-art ways to protect locations that suffer from fragile energy supplies. The city of Nice was chosen as the location for the French pilot, as it represents just such a fragile energy region. 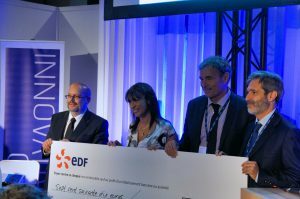 The pilot was carried out by the local energy provider EDF, the French research institute CSTB, the Nice Côte d’Azur Métropole, and Experientia. Taking a user-centered approach, Experientia has been part of involving local families and stakeholders like energy companies and public authorities in participatory activities to help define the project concept. The result of the collaborative design process was the CITYOPT app. 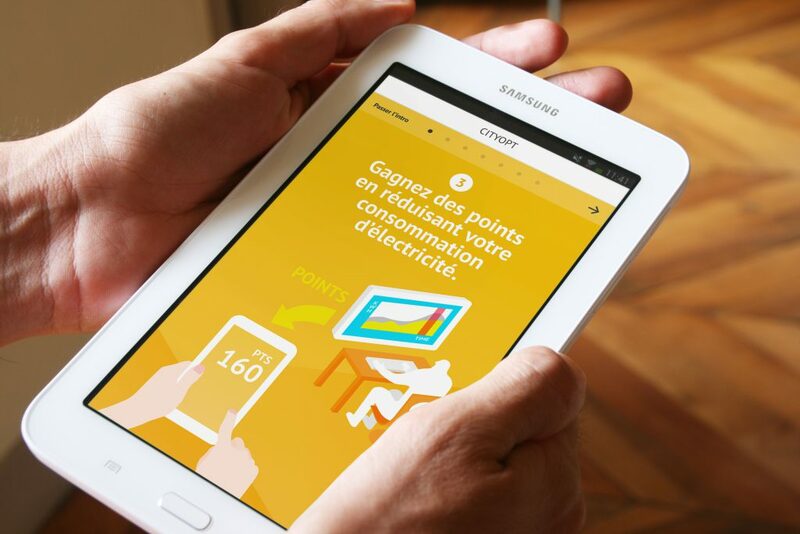 The app was distributed to 140 families living in Nice, France, for a pilot scheme to see if the app could help people to change their energy consumption behaviors. One of the CITYOPT participants using the CITYOPT app during an interview with Experientia and EDF researchers. In the winter of 2015-2016, our participating families were sent a warning SMS the night before there was going to be a peak demand for energy (such as the coldest evenings). The SMS invited participants to reduce the amount of energy they would use during the peak event. 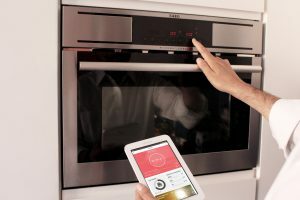 Their energy consumption reduction was measured by the Linky smart meter (which had been recently deployed to French customers). Once people’s energy savings had been measured, they were converted into points. The more energy people saved, the more points they were awarded. But the points weren’t for personal glory – instead, using a crowdfunding model, residents could choose to use their points to fund local non-profit projects, with the project that got the most support eventually gaining funding. Local anchorage is one of the key aspects of the CITYOPT project: offering people the chance to crowdfund good causes in the neighborhood helps to strengthen their sense of belonging to a local community. These community aspects of the program provided an increased motivation for participants to reduce their energy consumption, even when they weren’t receiving any personal economic benefit. During the peak alert, the CITYOPT app invites participants to turn off electrical appliances. The pilot demonstration results have been encouraging: participants reacted positively and responded to the SMSs on a regular basis: during peak loads, EDF registered a decrease of electricity usage equal to 300Wh per household during the winter alerts, which is approximately 28% less than the estimated business-as-usual average in the same time interval. 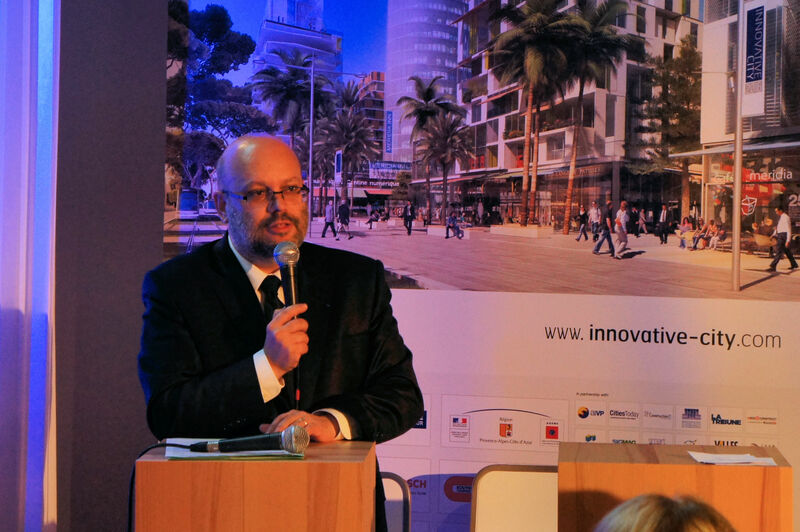 Last Thursday the Innovative City 2016 conference held in Nice hosted the CITYOPT pilot’s final event, in which Patrick Guibbolini, on behalf of EDF, and the newly nominated Mayor of Nice, Philippe Pradal, awarded the three non-profit projects backed by CITYOPT participants. The Mayor of Nice, Philippe Pradal, giving an introductory speech during the CITYOPT final event in Nice. Each project received an amount of money corresponding to the number of points donated by the CITYOPT participants. While the small scale of the pilot means that the funds raised were not particularly large at this point, it does suggest that significant results could be achieved by extending the project to a broader community of participants. PIMMS (Point Information Médiation Multi Services): a service for elderly people living in rest homes, who risk isolation from society, to give them guidance on their rights and administrative support. Les petits débrouillards: an association involving children and teenagers in public experiences and challenges mainly related with scientific topics, taking place in the local urban context. Caisse des écoles: helping schoolchildren by buying books, CD-ROMs and digital equipment (such as computers or interactive multimedia boards) for local schools and libraries. The award ceremony in which three local non-profit projects received a check with money donated by participants through their energy savings. While the Nice pilot is now concluded, the CITYOPT project is not finished. The next steps will focus on analyzing the collected data: not just the energy consumption during peak loads, but also usage of the CITYOPT app, in order to better understand the strengths and weaknesses of program. Experientia will focus on addressing end-users’ satisfaction, and will suggest areas for further improvements to increase the participation rates.